Meatless meals. I love them, my husband, not so much. Well that’s really an understatement. He hates them. But this one, he loved. I keep calling this a lasagna, yet I don’t know why, because there’s no pasta in it. But it does have layered things and mozzarella and Pecorino Romano cheese. Maybe it should be called a clean eggplant Parmigiano because the eggplant is neither breaded nor fried and there’s very little olive oil in it. No matter, this is really, really good. It’s fresh and bright tasting and the zucchini was still a little crisp with the crunchy goodness of the bread crumbs – this is my kind of dish! Perhaps you could suggest some names for me? So I made this a week ago last Wednesday. I really try to do one meatless meal a week and two fish nights and then chicken, pork or lamb. We rarely eat beef. 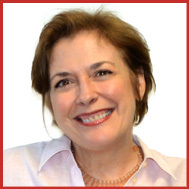 How about you – what’s your meal make-up? Preheat your oven to 450 degrees. Pour a little bit of peanut oil on a paper towel and wipe a rimmed baking sheet with it. Lay eggplant slices on top and season with fine grind sea salt and pepper. Roast on the bottom rack of your oven for 20 minutes. When done, remove slices with a thin metal spatula so the browned parts stay on the eggplant and not on the pan. Reduce oven heat to 350 – 375 degrees. Meanwhile prepare the zucchinis, tomatoes, garlic and ramps or thyme. TIP: Slice your cheese while it’s cold as it’s easier that way. Then leave out to get to room temperature. Slick a tiny bit of olive oil in the bottom and sides of a 9” x 13” Pyrex glass pan. Put in a layer of sliced tomatoes, Then a layer of roasted eggplant, then the minced garlic, mozzarella cheese and then zucchini. Grind some pepper on top. Drizzle on top 1.5 Tbs of olive oil, then the ramps or thyme, and then the final layer of tomatoes. Cover with aluminum foil and bake at 350 – 375 degrees for 25 – 30 minutes, until liquid is bubbly and the zucchini are fork tender. Meanwhile, mix 2 tbs. 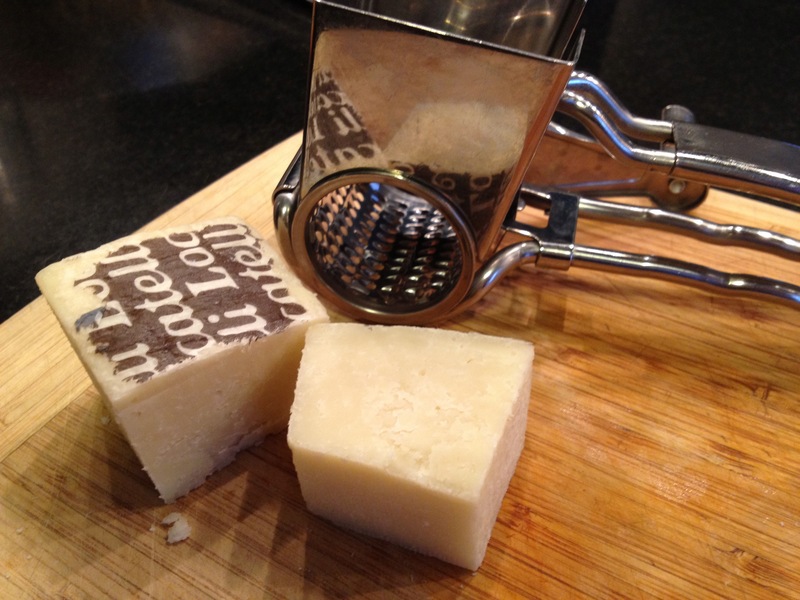 olive oil with the breadcrumbs, parsley and grated Pecorino Romano cheese. Toss to combine in a small bowl and season with salt and pepper. Remove the aluminum foil and turn your broiler on. Sprinkle evenly over the top of the whole dish. Broil the dish to get the breadcrumbs crispy, about 2 – 3 minutes. Watch carefully so it doesn’t burn! Let rest for 10 – 15 minutes before cutting and serving. Enjoy!! I served this with a side of pasta with some garlic and parsley. Delish!! UPDATE: Thanks to Jenny Dechico for helping us find a new and improved name for this dish! There was an article in the NY Times a week or two ago about the wonderful fresh bounty available now at farmer’s markets and because everything looks so good, the propensity to overbuy and then how do you store and use so many vegetables? I confess I am guilty of this, and because I am the daughter of a mother who grew up during the Great Depression, (and not to mention our own depression now), I hate to waste food. So I made this one dish pasta meal, chock loaded with vegetables. I was going to make this a meatless meal until I discovered a little bit of spicy chorizo and some sweet sopressata that needed to be used up as well. 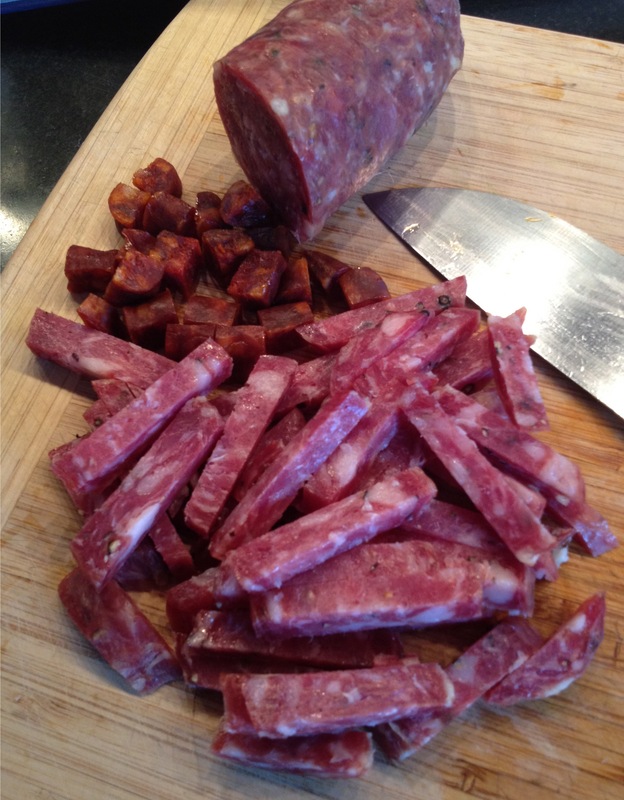 I loved incorporating the dried sausages. First of all, when you sauté them, you release the fat from the meat so use just a tiny bit of olive oil and that sausage fat adds a lot of flavor! Also, I personally loved the chewy texture the dried meats provided – different and delicious. Now I just threw this dish together on Wednesday evening and we were ravenous so I’m sorry to say I did not measure or weigh the ingredients, but I did take pictures along the way! I hope you like this dish as much as we did. Okay, so this may seem like a lot for you to do but a lot of these things can happen concurrently and it really is easy. Preheat your oven to 450 degrees. 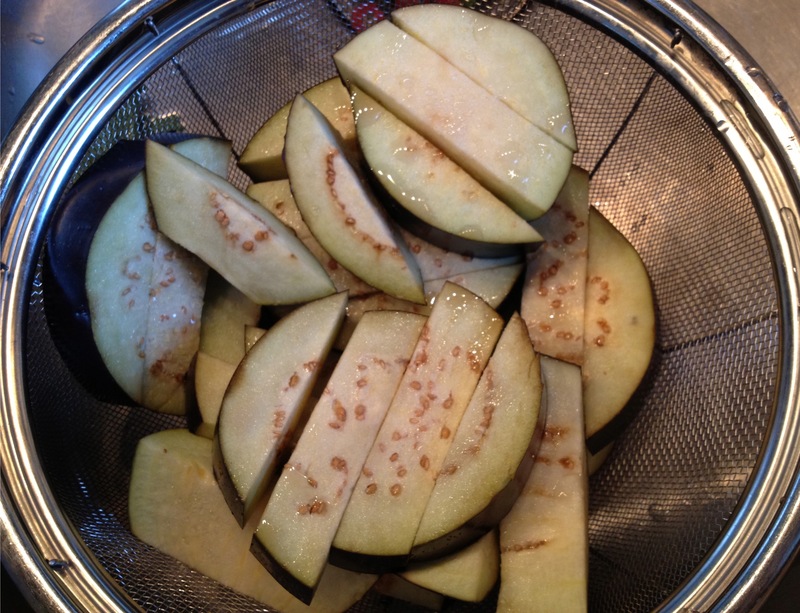 Place your cut eggplant in a colander in a single layer and salt generously with fine sea salt. Stack additional layers of eggplant and salt on top of each layer. Let sit and drain for at least 20 minutes or longer. This takes the bitterness out. Put about a tablespoon of peanut oil on a rimmed baking pan. Spread all over with a small paper towel. Pat dry each piece of eggplant and put on the prepared pan with space in between. Place on the lowest rack in your oven and bake for 25 minutes, until the bottoms are nicely browned. When it is done, scrape off with a metal spatula and place on a plate. Meanwhile, place the broccoli rabe in a large pot. Cover with cold water, and salt with coarse sea salt. Place the pot on high heat. As soon as you start to see bubbling along the edge of the pan, remove the broccoli rabe with a slotted spoon to a strainer or colander. DO NOT DRAIN THE POT, You will use this water to boil the pasta in a little bit. 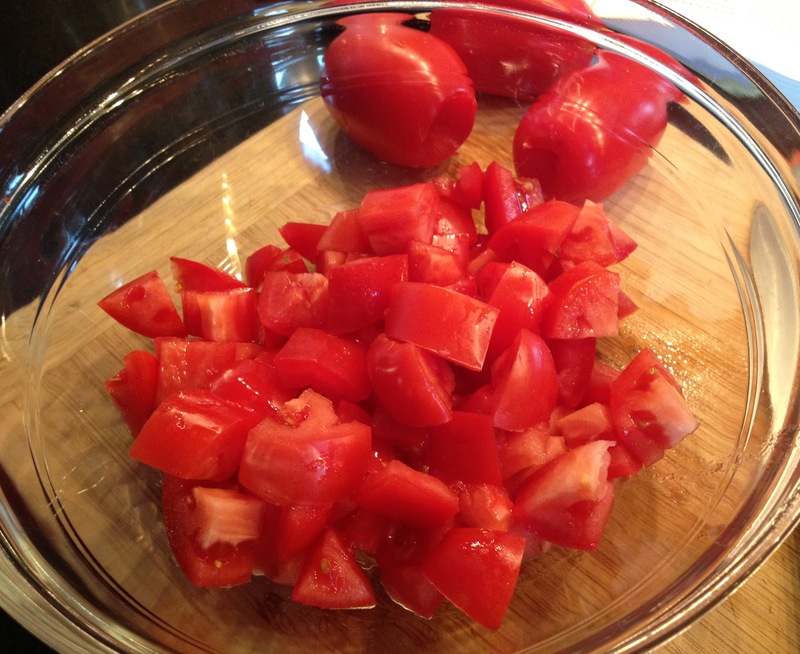 Cut your tomatoes and put in a bowl. Salt with fine sea salt. Toss and let sit. Heat 1 tbs. olive oil in a large skillet. 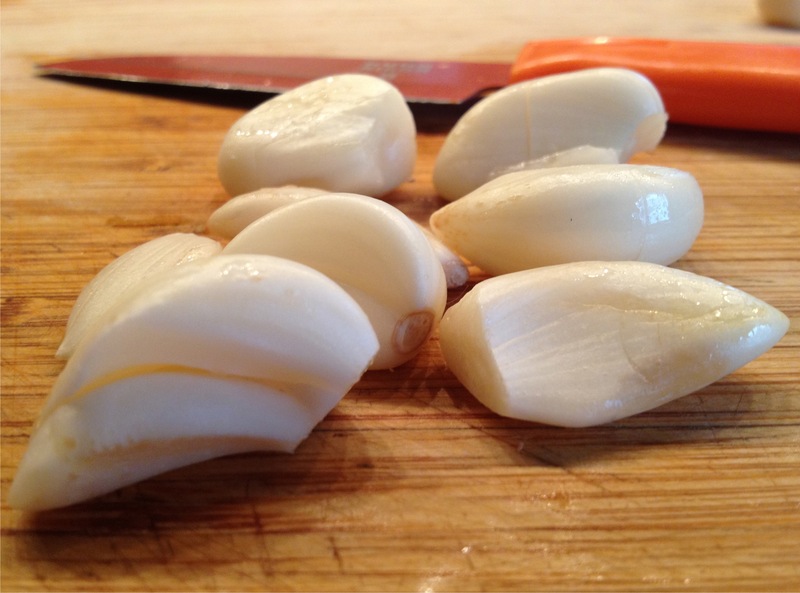 Put the minced garlic in and sauté on very low heat for 5 minutes. Have your sausages and grated cheese ready. Add the sausages to the garlic and oil, raise the heat to medium and sauté for 6 minutes more. 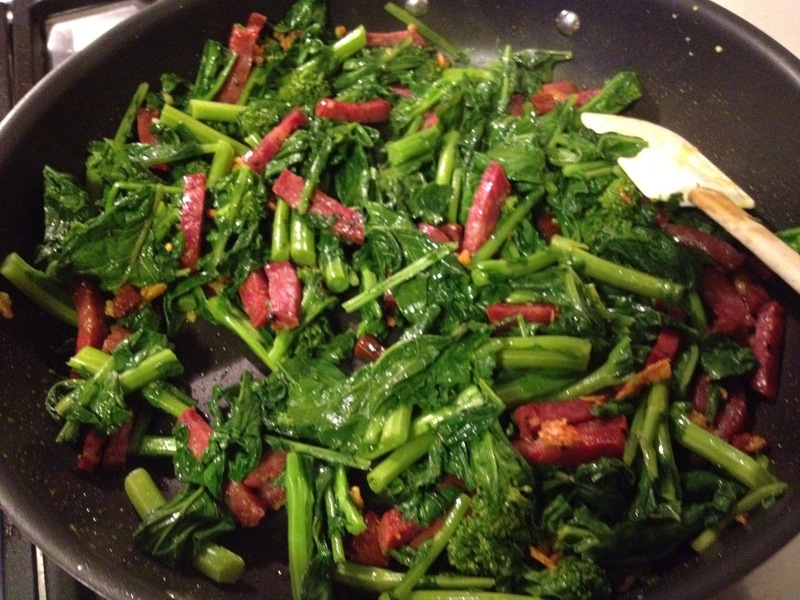 Add the broccoli rabe and toss and cook through until tender. 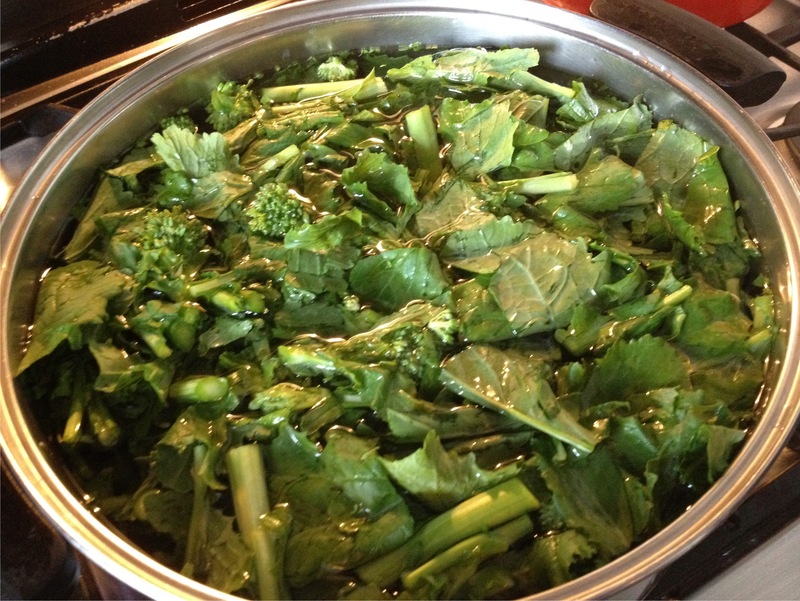 Reboil the broccoli rabe water, adding more if necessary. Boil the fettuccine 2 minutes less than the package instructions and then test to your liking. I like it al dente. Save some pasta water. Drain the pasta. 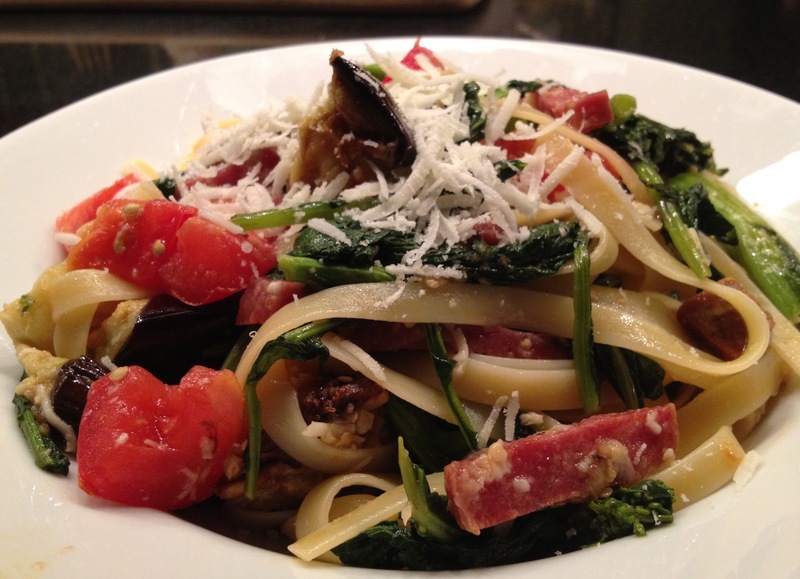 Put half of the fettuccine, half of the eggplant, half of the tomatoes, half of the broccoli rabe /garlic/sausage mixture, some cheese and 2 -3 tbs. pasta water together in a large bowl and toss. Finish with the remaining ingredients. Toss thoroughly to combine. Serve and top with more cheese if needed.